Ciaz is getting a makeover in 2018 and the facelift will be unveiled by mid-august. This particular Nexa variant didn’t receive any update for four years and it’s the perfect time to treat the loyal fans who were waiting for it. The festive season is just around the corner and there is no better time to own it. The all-new Ciaz will exhibit some noticeable cosmetic changes along with updated features. So will you book the new ciaz facelift this August? 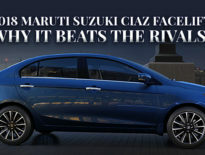 To know more about the Maruti Suzuki Ciaz facelift, read on. When will be the Maruti Suzuki Nexa Ciaz facelift launched? Only a few things were revealed in the video teaser of the facelifted Ciaz, but it showed a glimpse of what lies in store for the Nexa enthusiasts. The car was not shown completely, but a few key elements were highlighted like the honeycomb grille, the stylish LED headlamps and the stunning tail lamps. 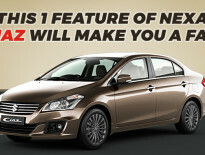 So for all of you wondering about the maruti ciaz facelift launch date, the bookings are now open. How to book the new Ciaz facelift? You can book your new Ciaz from Nexa Premsons at just Rs 11,000. With numerous aesthetic and mechanical changes, the car will be launched on 20th August 2018. Total value for money, the new Nexa Ciaz will be your perfect companion on the road. Created to inspire performance, luxury, and comfort, this sedan has a lot to offer. The new headlamps look absolutely stunning and the LED tail lamps have a gorgeous look attached to it. So here’s a quick look at the top 5 changes that the new Ciaz will feature. Smarter looks: New headlamps with DRLs will be seen in the Ciaz facelift. Instead of chrome, the black element is used, which makes it look more stylish and sporty. Front bumper: The front bumper is completely revamped and it now features new chrome surrounds, around the fog lamps, both at the front and the rear. Engine: An upgraded 1.5L petrol engine instead of the previous 1.4L one. This is a big change and the 1.5L K-Series petrol motor is optimized for 104bhp and 130 NM peak torque. Smart hybrid technology: The fuel efficiency will be optimized by the mild hybrid system and 4-speed automatic transmission will be offered on the ciaz petrol variant. In the 1.3L diesel variant, the smart hybrid technology was already there, now it is available with the petrol variant as well. Better safety equipment – This is a true all-rounder in the sense that Maruti Suzuki has not compromised in any department. Better safety is a feature that most car buyers look for and the new Ciaz delivers good on this department. See Also 2018 Maruti Suzuki Ciaz Facelift: Why it beats the rivals? The battle for the compact sedan segment is sure to heat up now and the Ciaz is all set to be a top-runner. So what are you waiting for? Pre-book the new Ciaz today and get ready to own an amazing car which is not only stylish and sporty but also high on performance. Call us now: 09608800400 and book the new ciaz facelift at just Rs 11,000. For more details on the offers, booking dates and special announcements, follow our Facebook Page.